"This video makes the basics of grant writing easy to understand.The many examples scattered throughout the video make the abstractideas more concrete. The graphics are well done and the pace givesthe viewer time to absorb the material and even take notes. Anyoneshould be able to write a simple grant proposal after watching thisvideo." Fundraisers are often intimidated by the prospect of writing grantproposals. But missing a grant opportunity can mean losingimportant programs and essential services. For the fundraiser inneed of practical skills and guidance, The Grantwriter's Start-UpKit shows how to prepare for the process of writing a successfulgrant proposal. The video and companion workbook are specifically designed to helpyou streamline your efforts and avoid common mistakes. Take the first step by watching this informative and engagingvideo. You will learn about the key elements of a winning proposaland gain invaluable insights from professionals in the field. Thepresenters draw from their extensive knowledge and experience ingrantwriting and grantmaking to offer direct and succinct advice.They share wisdom not only from those who write proposals, but alsofrom the foundations that approve the proposals. 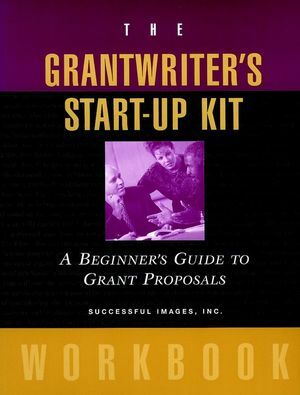 Successful Images, Inc. is the author of The Grantwriter's Start-Up Kit: A Beginner's Guide to Grant Proposals Workbook, published by Wiley. Identifying a Fundable Project or Program. Pinpointing the Need Your Project Will Fill or the Problem It WillSolve. Establishing the Methods You Will Use. Laying the Groundwork for Your Evaluation Plan. Identifying Sources for Future Funding. Getting Ready to Develop a Budget for Your Project orProgram. A. The 12 Key Elements of a Grant Proposal. The Cover Letter -- Sample Cover Letter. Table of Contents -- Sample Table of Contents. The Summary -- Sample Summary. The Introduction -- Sample Introduction. The Problem or Need Statement -- Sample Need Statement. Program Objectives -- Sample Objectives. Plans for Future Funding -- Sample Future Funding Section. The Budget -- Sample Three-Part Vertical Drop Budget. B. Some Tips on Strategy and Structure. Why Some Proposals Get Funded and Some Do Not.